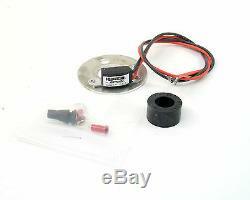 Pertronix Ignitor+Coil/Ignition Massey Ferguson TO20 TO30 w/Delco 1111740. Dodge / Ram Diesel Parts. Valves, Springs, Guides, and Kits. Delivers twice the voltage to the spark plugs, increasing horsepower, fuel economy, and spark plug life. 2:1 improvement over points in current fall time for increased coil output. Rotating cobalt magnets trigger a Hall Effect integrated circuit. Epoxy molding makes our module impervious to dirt, oil, grease and moisture. Will trigger most multi-spark CD ignitions. Available for 6 and 12-volt negative and positive ground systems. Legal in all 50 states and Canada C. This listing is for a 12-volt, negative ground Pertronix Ignitor and a Pertronix 28,000 volt specialty industrial oil filled coil for the following applications with a 4-cylinder engine using a Delco distributor with counter clockwise rotation and a clip down distributor cap. Massey Ferguson TO20, TO30 (Continental Z120, Z129 engine); distributor #1111740. Massey Ferguson TO35, 50, MH50 (Continental Z129, Z134 engines); distributor #'s 1112557, 1112570. Massey Ferguson 65 (G176 engine); distributor #'s 1112583, 1112589. Feel free to contact our professional sales team toll-free (within USA & Canada) at 800.756.1114 or (outside USA & Canada) at 601.693.8282, EXT. Thank you for looking at our listing and look forward to doing business! Thank you, the Falcon Team. Engine Parts Centers consists of nine engine parts warehouses located across the Southeastern United States with over seventy professional associates. Our corporate and administrative office is located in Meridian, MS. We stock a broad range of engine parts for passenger cars, small trucks, marine, diesel, industrial, agricultural and high-performance applications. Whether you need nothing more than a freeze plug kit or you're in need of a full deluxe engine rebuild kit - we've got you covered! A comprehensive engine kit program is available for thousands of engines with every kit provided to fit your exact needs! The company's operating platform is designed to serve all aftermarket customers effectively with a maximum service level. We supply the engine parts needs of custom engine rebuilders, custom engine repair centers, high performance operations, traditional auto parts operations and national wholesale and retail chains. We recognize our customers make a choice every day when they use our products and service and we are constantly redoubling our efforts to be sure we earn their business! If you need assistance with online ordering or locating a specific part, please contact one of our offices using the online form by clicking here. We stock thousands of engine parts, valve train parts & engine rebuild kits for gasoline & diesel engines available for passenger cars, light trucks, performance, off-road, agricultural, inboard marine & industrial applications. Don't see what you need? 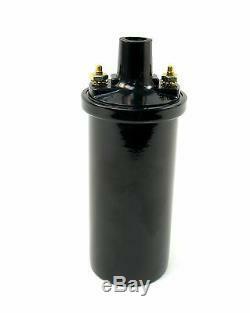 The item "Pertronix Ignitor+Coil/Ignition Massey Ferguson TO20 TO30 withDelco 1111740" is in sale since Tuesday, October 2, 2012. This item is in the category "Business & Industrial\Heavy Equipment, Parts & Attachments\Heavy Equipment Parts & Accessories\Tractor Parts". The seller is "falconglobal" and is located in Jackson, Mississippi. This item can be shipped worldwide.